The proposed Student Activity fee distribution might change after a margin of error amendment was added to the Student Activity Fee referendum on March 26. The Undergraduate Senate passed the amendment to the Student Activity fee referendum after SG Comptroller Ben Johnson and President Pat Kelly found errors in the Student Activities Leadership Committee’s (SALC) bookkeeping. This margin of error allows for students to consider a 56 percent distribution of the Student Activity fee to SG and 22 percent distributions to Club Council and Student Media Board. Those are the percentages the SALC will be advocating for during Sunday’s referendum, according to Johnson. Originally, the SALC committee proposed a 50 percent distribution to Student Government and 25 percent distributions to AUCC and the Student Media Board, The Eagle previously reported. “There is no reason for the first SAC fee discussion to fall apart over a typo,” Johnson said. Johnson overestimated the total revenue for the Student Activity fee after the proposed increase, he said. The original projection showed $1.3 million as the total revenue when in actuality the total revenue would be $1.1 million. With the actual projections, SG is slated to receive $492,000 of the Student Activity fee, leading the SG to call for the amendment. “This is not something we could function on,” Johnson said during the emergency senate meeting last night. The senate passed an asterisk change to the original bill to allow for a 6 percent margin of error, allowing the distribution of SAC to be adjusted with the reality of enrollment, Johnson said. “In all honesty, this [margin of error] should have been included in the first place,” Kelly said. Leaders in AUCC and Student Media Board spoke in favor of the changes at the emergency senate meeting. WVAU General Manager Max Tani said he supported the changes and stressed that WVAU needs the money the possible redistribution will provide. Tani addressed the audience and told them that WVAU is already underfunded and cannot send correspondents to conferences or use digital analog due to budgetary restrictions. Maeve McDermott, Student Media Board chair and one of the media representatives on the SALC committee, said she supports SG’s changes to the referendum. “I’m glad we established the new wording to account for any unexpected fluctuations in future Student Activities fund amounts, and am looking forward to continuing campaigning for this important referendum,” she said. 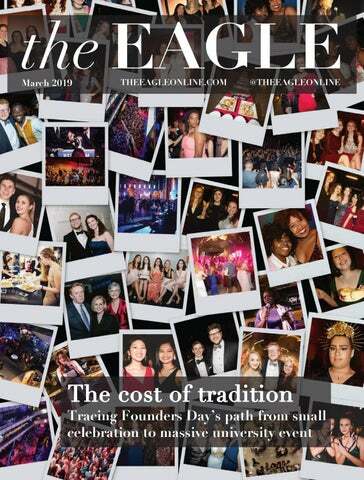 Disclosure: The Eagle receives funding from the Student Activity fee and is a member of the Student Media Board. Clarification: A former version of this article suggested that SG Comptroller Ben Johnson and SG President Pat Kelly said there was an error in SG’s bookkeeping instead of SALC’s bookkeeping. Corrections: A former version of this article said that leaders in AUCC and the Student Media Board spoke out against the changes to the referendum wording. They spoke in favor of the changes. A former version of this article said that WVAU General Manager Max Tani said he did not support the new changes. He spoke in favor of them at the meeting.